This factsheet is part of our series of guides outlining "Need to Know" information about the bioeconomy in Europe. The factsheet was produced through the Interreg IVB NWE Bio Base NWE project. The Bio Base NWE partnership consists of seven European organisations, Bio Base Europe Pilot Plant, Belgium; Bio Base Europe Training Centre, The Netherlands; NNFCC, UK; Technology Centre for Biorefining and Bioenergy (TCBB), Republic of Ireland, CLIB2021, Germany; REWIN, The Netherlands and Gent Bioeconomy Valley, Belgium. The Bio Base NWE project has now come to an end. However, BioBase4SME is a new 3-year project launched in 2016, as a continuation of BioBaseNWE with additional support services for SMEs. This factsheet gives an overview of the European Union’s bioeconomy innovation technology system. It includes the key government interventions, research initiatives, networks and finance instruments, in the EU. In 2012, the EC adopted the strategy and action plan Innovating for Sustainable Growth: a Bioeconomy for Europe, to shift the European economy towards greater and more sustainable use of renewable resources. This bioeconomy strategy is part of the Europe 2020 flagship initiatives Innovation Union and A Resource Efficient Europe. The goal is a more innovative and low-emissions economy, reconciling demands for sustainable agriculture and fisheries, food security, and the sustainable use of renewable biological resources for industrial purposes, while ensuring biodiversity and environmental protection. To regularly assess progress, and make information accessible, the EC fund the Bioeconomy Observatory, managed by the Joint Research Centre (JRC), which collates data and documents on EU bioeconomy policies, research and markets. 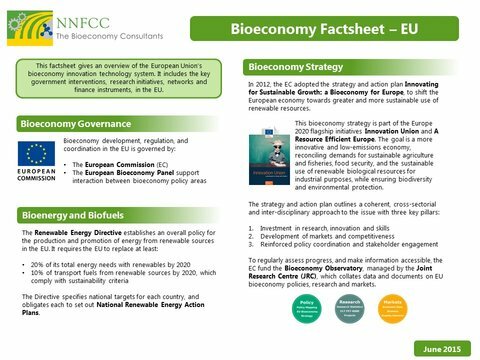 For further information about the bioeconomy in the EU, please download the factsheet​, or contact Dr Caitlin Burns, NNFCC.